As robots ever more deeply penetrate society and the job market, the “Turing test” is probably the only test you will ever, in your entire lifetime, have to both learn how to pass and how to administer. No idea what I’m talking about? Before getting acquainted with the Turing test details, listen—and listen carefully—to Time magazine’s Washington Bureau Chief Michael Scherer’s recordings of a “robotic” conversation with “Samantha West”, ostensibly both a health insurance telemarketer and a human. Is “Samantha” Actually a Robot? If, indeed, Samantha is a robot, “she” was trying to pass what has come to be known as the “Turing test”. At the same time, Scherer was attempting to administer a variant of it. can convincingly and therefore indistinguishably imitate human behavior [intelligent or not, i.e., including “Artificial Stupidity”]. This is the “standard” interpretation of the Turing test. can fool a human observer and participant into believing either that it is at least human or that it is, in addition, what it claims to be, e.g., a female, a qualified doctor, or a telemarketer. To this I would recommend a “logic bomb” Turing-esque test—asking questions, posing riddles or presenting situations that involve paradoxical, normally mind-numbing challenges, such as “Is ‘This statement is false’ true or false?”—the famous “Liar Paradox”, which, in the annals of sci-fi, are guaranteed to make the robot brain shudder, spark, melt and explode. Another, even stronger test I propose is testing for whether the entity can simultaneously perform as agent, object and observer—something unique to conscious beings, e.g., when your fingers as agent pinch your cheek as object, triggering the observation that it happened along with [reported] awareness of both the sensations of pinching and being pinched. Only self-aware entities capable of not only observation, but also meta-level self-observation, can do that. However, given the possibility of advanced faking capabilities, it cannot be ruled out that even this test might be verbally passed by a voice-enabled machine. Nonetheless, what I call the “AOO” [Agent/Object/Observer] test raises the question of whether whatever is to count as “thinking” requires passing it. Perfect Robot Faking: Imminent, or Already Here? The case of Samantha aside, how soon will robots or other A.I. platforms be able to do a better job of “pretending”, i.e., to spectacularly pass the Turing test, or will they always be vulnerable to detection, if not the classic robot-brain sizzling meltdown when asked an unanswerable question, like a Zen koan? It won by convincing a panel of judges that it was more human-like than half the humans it competed against. Unsurprisingly, the 2013 BotPrize competition has been canceled. I suspect that, ironically, her incessant use of “like”—e.g., “It’s like”, “I’m like”—is strong evidence that she is a robot, because, although annoyingly persistent, it was still less than the like-riddled babble of the stereotypic human California “Valley Girl” immortalized by Frank Zappa. Most likely, the dream-weaving female voice was that of a “Silicon Valley Girl”, a silicon-based machine or software, programmed with “artificial stupidity”. Perhaps Turing would have suggested asking her, “If you are not a robot, do you think that ‘If I am a not a robot, then this statement is false’ is true?” [Whether she is not a robot or not, if that quoted statement is true, it’s false; if false, then it’s true]. But then, if she were a Valley Girl, silicon-based or otherwise, she probably wouldn’t get it. Given the increasing sophistication of robots, it is conceivable that one day you and I may have to prove that we are not robots. But that’s not the worst of it. If robots advance even beyond the limits of our current human imaginations, we may have to prove not that we aren’t robots, but to try to prove through faking that we are. A Comic-Book Turing Test: “Who is Superman”? 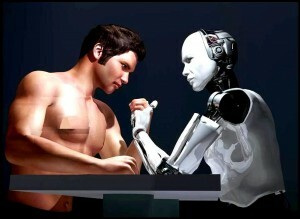 You must know the story of a kind of Turing test administered to a super-computer, in the form of the question, “Is there a God?”, posed as a challenge requiring super-computer skills to definitively answer. The important implication of that password test for all versions of a job interview Turing test is that whether a robot or a human is being tested, if the response is too good to be true, it probably isn’t. Historical note: Just before his 42nd birthday in 1954, A. M. Turing swallowed cyanide and died after conviction of and chemical castration for homosexuality, despite his enormous code-breaker contributions to the survival of the UK, under draconian UK laws then in force. After a prolonged crusade by his supporters, Turing was formally pardoned by the Queen almost 60 years later, on Christmas Eve, 2013, Turing’s centenary.